Peter Colvin takes us back to Craighead Park in 1982 and Ashfield in 1950 in this latest (and probably last) selection of archive snapshots. Competition Result: Where Is It? The answers and winner of our 'Where Is It?' competition that offered a copy of Philip Dalling's new hardback book, Classic Speedway Venues Past and Present as the prize. "Did anybody else see Tai on BBC Breakfast programme, complete with his GP bike? I thought he came over exceptionally well and will prove to be an excellent ambassador for the sport (shame about the ear rings though! ) when I was a lot younger I did break a collarbone twice when coming off my road bikes, so I know how brave Tai was to ride so soon after. Let's hope a British world champion gives a big boost to our great sport. " "What a great article, sums up my feelings as well, I think Tai will win a load more world titles if he can keep as focused as he is at the moment, what really impressed me was he didn't just play safe and ride around at the back arfter heat 5 when the championship was won he went for it right up till the end, a sign of a true champ and a heart of a lion!" "Great article David and spot on in my opinion The first time I had the privilege of seeing Tai race was at Perry Barr and the experience lasted for approximately half a lap. The poor kid ended up on the dog track after clipping a back wheel coming off bend 2 and clearing the fence superman style. I think he broke his arm which was a shame but it could have been a lot worse. The next time Rye House visited he was injured so we had to wait until the following season to see him. Basically he was untouchable on a track he'd hardly ridden, a story repeated all over the country. He was and is an incredible talent and a worthy world champion if ever there was one. My claim to fame is, on seeing Chris Holder for the first time, whilst holidaying on the IOW, predicting that he too would one day be a world champ. He was (and is) awesome. All the best to speedway fans everywhere." "We attended a lot of speedway races in southern California in the late 60's and into the 70's. I worked with Tommy Moran, Kelly & Shawn's Dad and also did some desert riding with Sam Ermolenko. I have a lot of great memories of the Moran brothers from the early days on the Jr. bikes. I haven't attended a speedway race in a long time and I think it's time I went back." "Hi Ian, I left out the late and legendary Freddie Williams as a mark of respect to his being a staunch Welshman. I'm sorry if I offended anyone for doing so. It's just a bit of fun !" "I hope that efforts are being made to ensure the preservation of Ralph Smith's art work? His drawings are among the finest I have seen. " "What a great poem. I am about to take a funeral service for a Speedway fan and will be reading this poem giving full credit to Bob Wilson. Being a Speedway fan myself I'm going to enjoy sharing this poem of Speedway passion at the service. " "Many good points by Phil. Covers, if properly designed, could be a success - but common sense (and local weather forecasts) must also be used. There is little sense putting them on a saturated track, particularly if the material cannot 'breathe'. Also, there is no point lifting them if persistent or heavy rain is forecast during the meeting time. The 7 day forecast should be checked. If there are a couple of wet days before the meeting, prepare the track and put the covers down in good time. If, on the morning of the meeting, the forecast is for persistent or heavy rain during the meeting, cancel in good time. Ironically, one possible problem could be track watering - if covers come off late, the track base could be too dry. To overcome this, the track curator may have to remove, water and replace the covers several hours before the meeting - sorry Phil, more work for you and the other volunteers. " "Whilst appreciating the efforts of all volunteers at any track and their contributions are vital and invaluable you have to question whether speedway is a professional sport or not! An excuse for track covers not being used because a track cannot get volunteers, people struggle because they are full of over 60's so the covers are too heavy and take a lot of carrying...this cannot be used by any track as an excuse...it's a valid excuse from the actual volunteers, who I admire and feel sorry for, but not from a track who's responsibility it is to get the covers used properly if they are provided..speedway at club level seems to an amateur sport masquerading as a professional sport." It's always nice to see a new track opening and Central Park in Sittingbourne opened for buiness in 2013 as the home of the Kent Kings. Here are some pictures of the venue courtesy of good friend of the site Ian Presslie. 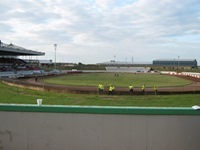 Notable features of the new track are the massive soundproof fence and the terrace without a roof on the back straight. 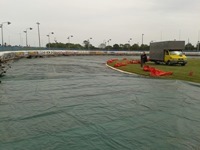 The rain-off at Birmingham on Monday resulted in a great deal of anger because the BSPA track covers had not been used. As Phil Rice explains, there's more to covering the track than you might believe. Phil speaks from experience of performing the task at Swindon. Still a few days left if you want to enter our competition to win a copy of Philip Dalling's new book. All you need to do is identify the six tracks we've pictured here. The fabulous Speedway Fiction website continues to add new items of interest on a regular basis. Latest additions include a TV times article on Terry Betts, a Look-in feature on Kent Youth Motorcycle Club and a speedway story from the 1951 Champion Annual. "Oh what wonderful memories I have of the mid sixties and Igor riding for USSR at Exeter. Simpler never to return times but priceless memories, seems as if yesterday and when I hear that Igor has gone it makes me treasure and grab life all the more, thanks for the memory Igor and all the Russians who rode. " "Superb line drawings. Would like to see one of Sam Ermolenko." "Yes I remember the old days of Champion Speedway very well Ivan.....also do remember you riding there...however memories can play a trick, I am pretty sure I used to drive down with Gary Ford on the Sunday and drive back the six hours it took us in time to go to work Monday morning. Some of the Nationals (two day affairs) were absolutely fantastic, great racing throughout the two days and as you stated the place was packed! Oh yes, and it usually rained......I remember once it rained so hard there had to be two or three inches of water all over the track and they were going to call it off. Gary said to me, "get my bike ready will you, they are not going to cancel this". I thought he had lost his mind......however he went out and four brilliant laps of Speedway. Joe Bieseker worked the track and a couple of hours later we went racing on a first class track. aaaahhh, happy days." "Fabulous background detail to a period of the sport I know little about. 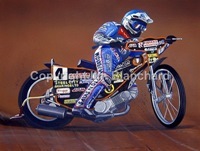 I wonder how much modern speedway owes to Mike Parker?" "Great piece, bringing back some wonderful memories especially of Peter Craven and latterly Mark Loram both great riders. Mark was great at using all the track to get to the front he was terrific to watch. If GP tracks had been less slick he would have won many more GP points. Tai's achievement has been brilliantly inspiring. I am sure more of our riders will now not want to settle for second best, but to get to the top just like Tiger Tai has." "Great article Tracy - hadn't realised the one per decade pattern before. Whose the next English world champion then - Robert Lambert in 2020..??" "Thanks for that info Patrick, another piece to the jigsaw. Problem is, Ivan was NOT one of the highest 8 scorers from the NZ Final at Western Springs. Yes, he was PRESENT for the Christchurch meeting but that did not alter the fact that he was not in the top 8 at Auckland. Another thing, the Christchurch meeting was NOT a re-staged NZ Final. Mitch Shirra is still the 1982 NZ Champion. The results of that meeting were not declared 'black'. The Christchurch meeting was a NZ qualifying round of the World Championship. Hastily arranged in place of the cancelled Australasian Final. As Alan Mason told me a few days before it was run, only those in the top 8 at Auckland would have their points count. As Alan was not one of them, I asked him, what if somehow he was 1st or 2nd ? "Wouldn't count!". The non appearance of John Goodall and Mike Fullerton should not have altered that arrangement. Top 8 scorers from Auckland, yes. Was Ivan Mauger one of them? No!" "Great article that bought back memories of watching Jack ride for Sunderland when they visited Rayleigh in the early 70s . Most of the Rayleigh riders kept clear of Jack on the track, except Brian Foote. They would just bang elbows for 4 laps..!! Met Jack in the bar at Rayleigh once when I was aged 8yrs (1972). He'd just broken his ankle in the meeting, but was sitting at the bar with several pints lined up and happily signed my autograph book. This fits with other comments about there being another very different side to him than the one we saw on the track - we were very catious about asking him for his autrograph thinking he'd be the bad guy, but he wasn't like that at all." "Not so, Phil. The Gornja Radgona track is in Slovenia, Gorican is in Croatia. What You are talking about is the speedway track at Prelog, that is no longer in use since it is just a few miles away from the Pavlic family's new speedway venue at Gorican. The pictured above former world long-track venue at Radgona (this was a 1,000m track) is located in the Slovenian town of Gornaj Radgona, right on the Slovenian/Austrian border." 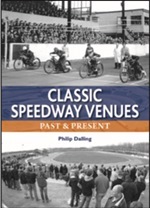 You can win a copy of Philip Dalling's new book "Classic Speedway Venues Past and Present" by correctly identifying the speedway tracks pictured. The book is published later this month by Halsgrove. Tai Woffinden: It is what it is! Former rider David Walsh pays tribute to the new World Champion, fulfilling a destiny that David predicted for him several years ago. David Mcguire is looking for details on Nipper Harris - Can You Help? "Cheers Mik ! 1976 Australasian Final 4th place run-off; "Heave too me hearties Yo-Ho!" Phil Herne and Mitch Shirra, who had ridden well above his raw teenage years, lined up and were under starters orders. Along comes Ivan Mauger at 20ks or so and as he gets to the tapes, up they go! He flys into the corner as his opponents are leaving the gate. Well almost. Ivan rode in magnificence and I watched in awe as he 'aced' 4 perfect laps and flew across the line to set a new track record in the process. This is for me, THE best race I ever saw Ivan ride. BUT that is NOT the story and I'm sorry, I can't tell it. The solids would hit the airconditioning and I'm not keen on that kind of fallout. The guy who could tell it won't and I must protect my source! Love 'Hill Street Blues' me! HOWEVER, how good are you at joining the dots? Not mentioning any names, the story involves a referee who did not operate the starting tapes. A starter who did operate the starting tapes and a Speedway Superstar who had to win to safely qualify to the next round of the World Championship. Throw in that mother of all flyers and ... Was Enola Gay? Who shot JFK? Follow the Yellow Brick Road my friend and Y'all have a nice day !!!" "Hi Steve, good to read this story. And may I say, it was written with passion, every word, was passionately thought & written. And that passion is alive today, with all the work you are doing back at your new home. Good on you we say, love it." "I enjoyed Steve Luxton's article but he is unfortunately a little muddled regarding Igor Plechanov's first appearance at Exeter. Igor rode there on 12 July 1965, and yes, he did break the track record, but not by 4 seconds. He clocked 71.4, which was 'three fifths' (as they used to say) better than the previous time set in 1958. However, that time was still remarkable, given that he set in Heat 13 on a rain-sodden track. I saw Igor that same year at Newport, and he broke the record there too!" "Fascinating article and look forward to parts two and three, as it was a few years after that I began going regularly as a kid and heard plenty about these years, but never knew too much of the details. Dare I suggest I can see similarities between 50 years ago and now and just wonder if history is about to repeat itself once again?" "Re Bronco Wilson: The Wembley rider died from injuries sustained in a crash at Harringay in August 1947 and not as suggested following an accident at New Cross." "I have a programme Opening Meeting - May 9th 1929 Coventry V Hall Green, Coventry Red and Green Hall Green claret and green, Coventry lost 19-23." "What a great read....I feel as though I was there though we didn't start going till 1976. I didn't even know Speedway existed back then." "I was at that challenge match at Halifax and in the Star the following week, little mention was made of it - even the fact that PC took home kingpin Eric Boocock from the back around turn one and two." "Great articles by Ian Harwood, bring back many happy memories of speedway in the late 60's and early 70's, keep up the good work." "British or English? Seems harsh leaving Freddie Williams off the list of champs because he was Welsh." Ian Harwood returns and looks back on his speedway experiences during 1971. One of his strongest recollections is of a classic speedway punch-up. Congratulations to Tai Woffinden on clinching the 2013 World Championship last night in Torun. Tracy Holmes takes the opportunity to reflect on previous English champs. Zdenenk Flajshanz shares pictures from Tarnow in Poland. Janusz Kolodziej and Maciej Janowski were the top home men around this circuit in 2013. With regards to last week's query, John Hyam reports that Skid Sprocket cartoons appeared in the 'Speedway Gazette' late 1940s and early 1950s. The fourth edition of the Old Time Speedway Journal is now available. You can view the latest edition for free by clicking here. Putt Mossman, Jeff Lloyd and George Gibbs are amongst those featured this time around. Retro-Speedway have just published issue 57 of the consistently excellent Backtrack magazine. Dennis Sigalos is the cover man in this edition, but look out for a young Nigel Crabtree dressed to kill as Sid Sheldrick's mini-me. Issue 23 of Classic Speedway from the same publisher is also now available and marks the 50th anniversary of Peter Craven's death with this special edition. "Jason Bonsignore IS Mr East coast speedway! He is truly the only reason that there is any speedway on this side of the country! Personally we only met four years ago, but in that time I feel we have built a friendship that I am so glad we have! This year at 49 yrs old Jason invited me to race in my first ever meeting and again at this summers US Open and those are dreams I've had since I was 11 yrs old! Say what you want about Jason, but if it's not 100% positive then don't say it in front of me! Long live NY speedway!" "So proud of my Uncle Ralphy, fantastic drawings. Hope one day I can be as good as him!" "Ralph's work is truly fantastic he brings years of speedway experience gained over years of being a mechanic for riders, tuning and customising engines and also as a fan and enthusiast of our great sport, his artwork brings all his enthusiasm, his empathy for his subjects and countless years of speedway experience to blend into truly fantastic works of art. I know Ralph won't mind me telling you that he only started doing these fantastic pieces when he retired from his full time job working for a aircraft manufacturer and has no formal art training, which in itself makes Ralph's work even more amazing. With Ralph's attention to detail I only wish he had been my engine tuner / mechanic when I was racing!!! Truly fantastic Ralph keep up the good work I love it!" "Great drawings and would like to see more of his work"
"Good to see our old team. Never to be repeated. What a waste of a well supported club. We are worth more than our money going to support a poor club, (Plymouth) That came nowhere near FALCONS ..Come see real speedway NO BRAKES, 4 laps. Exeter Aces Cyclespeedway Crofton Road, Marsh Barton, Exeter. Tuesday and Thursday Club nights. Come along, Want to ride ? will provide you wirh a bike, Just bring a helmet and gloves. We are the ACES !! phone 01392 439763 for more information ." "The article and feedback items make no mention of the fact that Ivan Mauger was allowed to take his rightful place in the Overseas Final after an appeal (to the RAC, chaired by Lord Shawcross(? )), that as one of the 8 highest scoring riders PRESENT at the re-staged final (Gooddall and Fullerton were absent), he was indeed eligible to qualify from the re-staged NZ Final. " "What a shame Dave Gifford never spent the time to get to know the man, because for those that did, they certainly knew CRAZY JACK quite differently. Jack was a man with many faces but there were no hidden agendas, he was always in control, a man that would do anything to help others, a man once met never forgotten, a man that touched the heart of so many, a man that talked a lot of sense, a man that with his death broke a lot of hearts, especially mine, I have never got over the loss of my brother, my world will never be the same. SO, for you Dave, I feel sorry for you and your narrow mind. To others, let us remember the man for what he was - a great guy!"